January 09, 2009 - Stack's, a New York based Numismatic & Antiquities dealer conducted an auction that included United States & Philippine coins belonging to the Golden Horn Collection. The Golden Horn Collection is composed of magnificent coins from the Ancient Civilization such as Greece and Rome, Medieval & Imperial Russia, Danzig & Polish Ducats, German States Talers, English Medieval & Imperial crowns, Irish coins, Italian & Liechtenstein, Spanish Netherlands, Swedish, Turkish & Ottoman Empire, India Mughal, Iran, Imperial Japan, Vietnam, Bermuda, Spanish South American crowns, Canada and its territories, Austria, and of course United States & Philippine coinage. Among the highlights of the Philippine lots are die trials and splasher from the Marcos period, particularly medals and coins designed and created by JJ Tupaz of "El Oro" for some special occasions for President Ferdinand Marcos himself. Other medals from the Commonwealth period were also featured such as Carnival medals and other medals for commemorative purposes. Some of the sought after coins such as the proof set of 1908 minted in Philadelphia, the last proof set issued from the United States and Philippine coinage made a rare appearance and was realized for $2750, a thousand dollars more than the previous estimate of $1750. A rare 1882 Four peso Gold coin of Alfonso XII in almost uncirculated condition, the only gold coin in the lot from the Philippines was also offered at an estimate of $1000 - $1200 but later hammered to $2200. A 1918-S 5 centavo mule, the finest of its kind and one of the rarest error and variety among the United States and Philippine coins also made a rare appearance. Estimated at $16000, it is the highest price among the lots offered belong to the Philippines lot. Among the controversial dates of the United States and Philippine coinage, 1944 and 1945 are two of the years that became one of the exciting periods of Philippine numismatic history. First, these are the years the second world war. The United States had concentrated its resources to the production of war machines, which became known as the U.S. War Effort. One of the policies implemented by the U.S. government was the discontinuation of the used of nickel and copper vital for the production of ammunition in the United States which had resulted to the one year 1943 One Penny zinc coated steel and the series of Jefferson Wartime nickels that are actually made out of silver. During that same year, the Philippines was under the rule of the Japanese Empire. The Philippines had plunged into a monetary crisis after the Japanese paper money did not make an impact to sustain the local economy, which had resulted into a massive inflation. 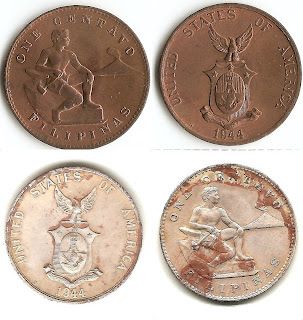 Though the U.S. government had produced coins for the Philippines during that two consecutive years. These coins were never released into circulation and remained in the hoard of the Commonwealth government due to the ongoing conflict. Early numismatists were thrilled to start their numismatic adventures when the war ended due to the diversity in the Philippine monetary system during the time of war. The relaxation of the flow of military information brought several discoveries into the numismatic world. The public became suddenly aware that there existed Guerilla scripts or war scripts, tradesmen token, the Commonwealth government coins, among others. Yet, the sudden break out of hoards overpowered the enthusiasm of the numismatic adventurers. The once known scarce materials were overflowing and surprisingly, most are in excellent conditions. Average Commonwealth 1944 and 1945 issued coins were either in mint state or in an almost uncirculated condition, making collectors too confident in judging that there was not a need for further exploration. The Law of “Supply and Demand” kicked in later in the 90’s when the Internet made a tremendous impact in the flow of information and communication. Collectors had realized that the supply of coins was dwindling and soon they were rushing to dig the once neglected hoards and hunt for varieties. The numismatic world was surprise to find that 1944 and 45 brought several varieties and some of them are rare, that they can be lined-up with the Philippine’s rarest coins. Among those famous varieties were the “Bar over 9” or the 1945 Fifty Centavos variety were a piece of metal bar can be seen on the top of the number 9 on the date of the coin, the 1945 Ten Centavos double date, the D over S or Denver over San Francisco on mint mark, and others. Recently, through this site, several trial strikes were introduced to the numismatic world. That included the 1944 One Centavo struck in white metal alloy instead of the normal copper planchet. Now, as an additional piece to our collection, this site is proud to introduce the 1945 Fifty Centavos Trial Strike struck in lead. 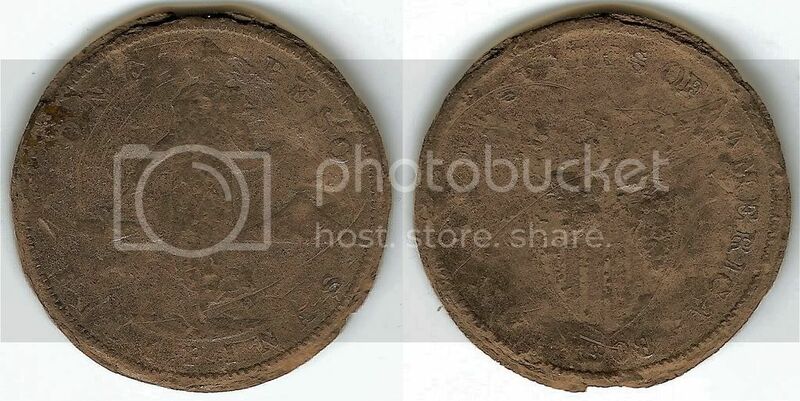 Similar pieces of this type of coin already surfaced in the past and most of them dated 1944. Collectors tagged them as contemporary counterfeits since the coin conditions were poor and appeared to be crudely struck. Nobody contested the finding until superbly struck coins of same material surfaced just recently. These coins have sharp details though some of the details like the caption embedded on the scroll below the shield was not as clear but still identifiable probably because the metal’s reaction with its environment. The coin’s surface is not bubbly but smooth, and the legends are sharp and are not deformed which only implies that the coins were struck and not cast as most contemporary counterfeiters did during that time. Surprisingly this is not the only trial strike that has been reported in the past. Other numismatists have also brought the information that there exist die trials in copper and brass. And as the old time saying goes "Happy hunting!" During the introduction of the new coins and the second term of then president Ferdinand Marcos in 1966, several pattern coins were created by then prominent medal designer and a former member of the Philippine Numismatic & Antiquarian Society (PNAS), Jose Tupaz Jr. Among the known varieties by Jose Tupaz, Jr. were coins which featured the first couple heads, the former president, the pope & the former president, and the national hero Juan Luna, which surprisingly, was the only hero included in the project. The patterns were later refined and the official coin set was released in 1967, which replaced the old design, which was still adopted from the original design of Melchor Figueroa. Some lead splashers of these patterns were also made, one of them is in the hand of a prominent dealer who made it as one of the display attraction in his shop. Though, not a single trial piece was reported to have existed when the mass productions were already started, there were clues however that the mint made trial pieces since during that same design transition, another major changes occurred. By way of proclamation of Martial law (RA 1081) on the 21st of September 1972, Marcos implemented a vision for the new republic that would particularly unify the Filipinos for the coming changes in the future. He called this project “The New Society”, or Ang Bagong Lipunan, a model society that would uplift the lives of the Filipinos through unification. The campaign was massive that he vetoed that such slogan would be inserted and carried out though the daily lives of the Filipinos, including the monetary system itself. Marcos already implemented the gearing of the society toward patriotism where Tagalog was adopted as the national language. The former seal of the Republic which bear its slogan in English was replaced by a new Tagalog version including the name of the Central Bank which was altered to Bangko Sentral Ng Pilipinas. Recently, a final trial piece in copper of the 50 centavos that bears the portrait of Marcelo H. Del Pilar surfaced. This is the final die trial before the die was finally destroyed and discontinued. Amazingly, the piece survived without much deterioration because it was covered in glue when it was first found. The coin is dated 1972, the last date of the 50 centavos denomination before it was discontinued to be produced in 1975. Only after the end of the regime, that the 50-centavos denomination was again introduced at the time of President Corazon Aquino. Whatever the reason why the “The New Society” or Ang Bagong Lipunan never continued the production of 50-centavos remains trivial and mysterious. Yet, during the time of the New Society that gold coin production was resurrected after more than a hundred years hibernation, which made it as one of the most exciting period of Philippine numismatic. It was another Sunday morning and I was preparing to attend the Bayanihan Auction last February 19, 2006. As usual, I got-up that early morning, reviewed the auction catalogue, blocked-out the items I am interested which I usually do using highlighters before I set off to the auction venue. Every auction day for me is a thrilling adventure because this is the only chance you could see some rarities, touch it, review it, and otherwise purchase it defending on how much you are willing to spend or if you really have the money to compete and win the bid. As for me, I usually carry just enough money to satisfy my interest add some missing coins or either replace the poorer grade coins that I have of my USPI (United States and Philippine Island) collection. I usually concentrate with this era because this is far I know in terms of knowledge and expertise in the Philippine coins. I usually skip the Philippine-Spanish coinage because of a limited number of resources that would help me appreciate it more. It was great to see the guys again bringing their new finds and showing them to the other guys. Bragging their newly discovered oddities, varieties, or errors either to be proud or to appreciate the price of their items---where it is also common to see the trade of buying and selling coins. It was already 11 o’clock in the morning when I arrived at the venue, which was held at the Quezon City Sports Club. I registered and got my number---the number thirteenth if I remember it correctly, picked-up my blue paddle before I headed-out to the display tables and inspected each and every item on the floor---of course, that I had not done properly which I will prove later. It was normal for the prospecting collectors to usually look at the finer graded coins or coins which are perhaps known to be candidate for rarities and just eying for the true good finds. As usual, poorer graded coins or common dates were left for the new collectors or neophytes in the hobby, which I observe is a common trait in numismatic, to help them (the new collectors) start with their own collection. As for me, I was not vying for coins that day but I was more focused inspecting the paper ephemeras and stamps, which were commonly offered by this particular organization. I was really surprised to see some of the best rare finds in this section particularly documents relating to the Philippine Revolution which are very scarce and truly prized in any conditions. Perhaps some of the most attractive items where documents signed by Dr. Maximo Viola which we know is a very close friend of Dr. Jose Rizal and if not for the man, Noli Me Tangere would not have been printed without the earlier providing some financial assistance. I was also looking at telegraphic letters and postcard particularly the one that has this rare oval handstamp going to Yokohama Japan, which I have read is a rarity in the world of philately. It was only later I reviewed the coins at the other section that I noticed there were some good coins on the table. There were about two to three scarce coins but none of them appeared very interesting because they were not that rare based on the professional’s judgment. Except for some coins starting at thirty pesos at the open category, most them are just the usual dinner at the table as I may say so. It was already 1:45 when Mr. Raffy Fermin, the program auctioneer announced that the bidding would be starting in just a couple of seconds. I headed straight to my chair at the second row prepared my pen to take account of the realized price, hold on to my paddle and focused on the announcer’s call. I barely noticed that a friend of ours, Prof. Eros or “Prof” as everyone calls him sat down about three rows far from where I was sitting. I ‘m quite aware of Prof. Eros presence since the man is a known scene steeler during auctions because of his humorous gestures like the way he raises his paddle and his sudden interruptions which could usually cause the lost of bearings for the other guys who were vying for their respective prizes. As the event progressed, there were numerous hurrahs and awes coming from the back probably collectors had won their longed prizes or items appreciated at spectacular value. But to my surprise there were also lots of expression of annoyance and intimidation among the crowd---and of course, it was not hard for everyone to point out who was the cause of the commotion---it was Prof. Probably for the new attendees it was an unusual scene but for most of us who have known Prof for the past events it was only a normal event. I had noticed that Prof was vying for a set of ugly One Centavo series graded between Very Good to Fine condition when I glanced on him at my back. Some of the veterans were smiling as I saw Prof grabbed to his paddle and raised it as straight as he could which was particularly noticeable with the professor’s gestures. The first call was thirty, seconded by thirty-five, forty, until the sole competitor gave-up and let it go at seventy pesos leaving the happy professor triumphant with his prize. Everyone knew that the professor deserved the winning because of the fact that nobody wants to possess ugly coins especially those coming from common dates. “Nugnog” is the local term for coins of such grades, which could have been probably derived from the word “bugbog” or tortured or physically unrecognizable because of natural factors or human handling. I checked the catalogue and noticed it was a series of One Centavo coins of 1903, 1919, 1921, 1934, and 1936 that the professor now technically owns. The event proceeded smoothly until we’ve finally concluded it with the last few remaining items from the ANTIQUES ETC. section which where I had also bided for a celadon bowl that finished at thirty pesos if not for the small detached but repaired piece could have commanded a higher value other than the awarded amount. Of course nobody vied for that item for that reason and thus, I won. I hurried up to the announcer’s table and lined-up to claim for the items I won. I was very happy because I had won some items, which are spectacular rarities that other collectors haven’t noticed but went for only thirty pesos, which I will write on to my next article. On my way there, I noticed the Professor and smiled at him. He seemed to be very excited otherwise because he went straight to the table and requested for the voucher immediately as if seems he’s the only person who should be attended to. Well, nobody minded the professor because it was normal to see Prof to act in such a way except for the fact of course, that doesn’t catch much of respective attention because everyone thinks that he’s just a scavenger or a foolish collector digging the spot where everybody had plundered. He was amongst the early batch of winners who emerges victorious with their trophies. Showing their prizes and justifying why they’ve cornered it at such amount, collectors assembled in pockets to finally conclude their personal victories including myself, Edward Chua and his brother, their friend George, and professor who went outside and sat around the table just outside the function room where the auction was held. We checked out on our catch and each one of us told his own knowledge about our new possessions. Of course, I was the sole member of the group who is knowledgeable about stamps so even though I got a rare Scott attached to a postcard for thirty pesos, it wouldn’t catch any attention so I decided to grab the professor’s find and started scrutinizing each coin. It was normal to us to share some advises, comments, or stories to increase our knowledge or to scoop some news about the industry and other topics. Then the most unthinkable happened, I noticed that the One Centavo coin of the professor bears a large S mintmark which has never been reported before and which the whole numismatic industry has never been aware of existence. To my excitement, I suddenly exclaimed “Pare, meron bang 1903-S?” (S-San Francisco Mint) Hey, Is there a 1903-S? (pertaining to the One Centavo coin I was holding) looking Edward straight in the eye. Edward dropped his jaw for a few seconds before coming-up with a hesitant response “Sigurado ka?” Are you Sure? Edward grabbed the coin from my hand and took a glance. He was otherwise in shock to hold a coin that doesn’t exist. It was very sharp in my head that the sudden thought of a fairy tale story, which has a similar ending, entered my mind. A magnificent Swan emerges from the Ugly Duck whom after all these years had survived the journey and remained mysterious until such time that it was proper to shed those ugly gray feathers and reveal its real identity. All of us were in hysteria as we concluded that I have discovered a unique pattern of the 1903 coinage. The rest was history!